Accomplishments of Foundation for India Studies (FIS) in 2011. Entering into its 6th year of operation, the organization continues to introduce new programs like the Indo-American Oral History project for the Houston Indian community..
HOUSTON: 2011 has been a banner year for the Foundation for India Studies with a great deal of exposure to its accomplishments in the main stream media like the Houston Chronicle and HCC TV. • January 17th: FIS participated in MLK parade. The theme was “Bridging the Education Divide”. • March 23rd : FIS signs a historic MOU with Houston Public Library to collaborate in the Indo-American Project. • March 25th: Held a private reception to Hyderabad artist Mr. OM Soorya whose trip was sponsored by FIS to conduct a week long panting workshop at UH School of Art. • April 3rd: Expressed solidarity with Anna Hazere in anti-corruption demonstration. • July 19th: First Oral history Interview of Dr. P.N.Rao conducted in HPL’s Gregory School studio. • August 19th: Celebrated 5th Anniversary at Jr. League and launched the Indo-American Oral History Project Jr. League. Key note speaker Mr. Charles Foster. Education Awards given to UH Provost Dr. John Antel and UH Vice-.Chancellor for International education, Dr. Strickland. Several organizations like UH, HCC, IACCGH ASIA SOCIETY participated in the event. • August 21st : Consul General, Sanjiv Arora introduces FIS and its activities to President Abdul Kalam. Krishna Vavilala Presents FIS 2011Annual Souvenir to the President. • August 22nd : FIS Chair, Krishna Vavilala was invited by UH to have lunch with former President of India, Dr. Abdul Kalam in UH Regent’s board room at the University of Houston. • August 28th: Set up a booth in Janmashtami celebrations at GBCC to promote Oral history project. • September 1st :Second TV broadcast about the Oral History Project aired at 7.30PM by TV ASIA from New York. • September 7th: Ms. Mary Sit anchor of Asia Connections – HCC TV, interviewed Krishna Vavilala, FIS Chairman about the Oral History project. • October 6th: Contracted TECH-SYNERGY, Irvine California company for transcription services. They have already delivered six transcriptions, three of which are uploaded onto HPL servers. • October 24: In Dr. Abraham Verghese’ lecture in UH Hilton School of Management, UH Dean, Dr. John Roberts credited FIS for initiating the India Studies program 5 years ago at the university. The Chairman of India Studies program at the university, Dr. Lois Zamora also recognized FIS Chairman, Krishna Vavilala during the same event. • November 3rd : Held a private reception to Dr. Bharat Gupta a visiting historian and scholar from Delhi university. • Five (5) Interviews were taped till now for the Oral History project in HPL’s Gregory School Oral History studio. Interviewees were Dr. Potu N. Rao, Dr.Bhalla, Dr.Mehta, Girish Pandya, Ms. Neeta Mehta. • President of India House, Mr. Jugal Malani offered to pay an year’s rent for a studio soon to be set in India House. Equipment for this studio is under procurement. • To expedite the interviews in the interim, a make shift studio was set up in Sugar Land. Dr. Nik Nikam conducted two interviews, of Dr. Jagdish Sharma and Mr. and Mrs.Koshy Thomas, at this location. • August 2012: India(n) Bee contest: New project to promote knowledge about India in school children and award Certificates and Scholarships. Project Chair: Surender Talwar. Details will be announced later. 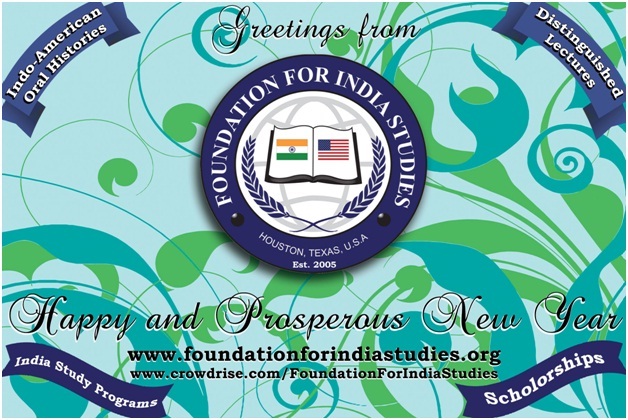 A registered, non-profit 501(C3) organization, the main goal of the Foundation of India Studies is to establish an endowed Chair in Indian Studies at University of Houston in order to provide quality education about India to Houstonians and facilitate learning and research in various subjects of India. To contribute, support and get involved with the Foundation for India Studies, please feel free to contact Mr. Krishna Vavilala at (713)795-5169.